Visit any of the shops throughout the Florida Keys to find something that will satisfy any taste. Stroll through one of the many art galleries or antique shops and enjoy a divine shopping experience. Shopping in Key West and the Florida Keys is better then ever! 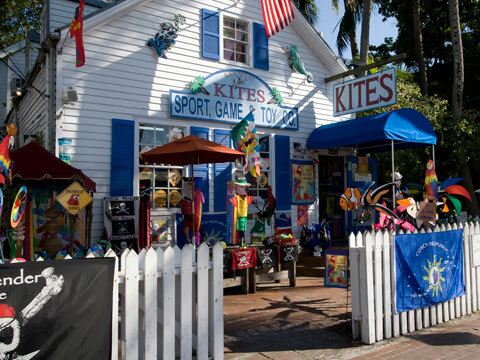 From Key West to Key Largo you'll find a countless numbers of shops, boutiques and galleries all along the Overseas Highway. Hunt for treasures in the Florida Keys without having to get in the water! These shops carry anything and everything you can think of. Whether your in the market for clothes, food, art, toys, or something for the garden your bound to find it in one of our stores. Many of theses shops offer locally made products that cannot be found anywhere else in the world. These quality products reflect the culture and heritage that has made Key West and the Florida Keys so very special. Make your family and friends jealous by bringing home your own little piece of the Florida Keys. KeysTV.com provides the largest selection of Key West and Florida Keys Shopping information anywhere! You'll find shopping info about Accessories, Art, Books, Clothing, Gifts, Souvineers, Hand Rolled Cigars(not Cuban), Jewelry, Home and Garden and Specialty items.